2018 has been quite a year. 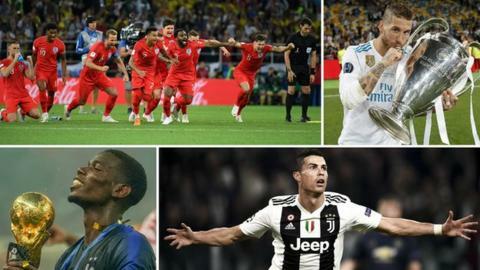 We have seen France reign supreme in Moscow, Real Madrid break Liverpool’s hearts in Kiev and England even win a penalty shootout on route to their best World Cup performance for a generation. Witnessing those events first hand has been the BBC TV and radio commentary team, who criss-crossed the globe over the past 12 months to bring you live coverage of some of football’s biggest matches. We asked them to provide their most memorable moments of 2018 as we reflect on another thrilling year of footballing drama. John Murray: This was the year of three of the best goals I’ve ever commentated on. Firstly there was Gareth Bale’s overhead kick in the Champions League final. Stunning. Then there was Ivan Rakitic’s amazing volley for Barcelona against Tottenham at Wembley with both feet off the ground. It was a thing of beauty. And then there was Cristiano Ronaldo’s breathtaking goal for Juventus against Manchester United in Turin, as he rifled in a ball that dropped over his shoulder (while running at full tilt!) in the United penalty area. I think that one topped the lot. Alistair Mann: I will never forget 27 October 2018 – it was a day I went to commentate on Leicester City v West Ham but which ended with me reporting on a tragic news story for Match of the Day. There are so many aspects to that awful day which will forever live with me but what I recall most vividly is walking past three people in the tunnel after I had conducted my post-match interviews, at whom I smiled as I walked towards the pitch, before moving past the ill-fated aircraft, which was parked on the centre circle. As the information began to emerge about the crash over the next few days and the identities of those who lost their lives were revealed, it became clear that the three I had acknowledged were Kaveporn Punpare, Izabela Roza Lechowicz and Eric Swaffer – three of those who so tragically perished that evening. It still causes a shiver through my body. My thoughts and prayers will always be with all the families of those who lost their loved ones that terrible day and I hope 2019 will begin to repair their broken hearts. Ian Dennis: 15 July 2018 was my best moment of the year and my career. To commentate on a World Cup final was the realisation of my dream. It was also 30 years after I’d sent a letter to John Motson asking advice on how to become a commentator, so a culmination of many years’ hard work. I remember feeling a combination of nerves and excitement but it is a day I will never forget. Conor McNamara: My best moment was Cristiano Ronaldo’s bicycle kick for Real Madrid against Juventus in April. I was in the stadium in Turin, commentating alongside Pat Nevin for BBC Radio 5 live. The height he managed to gain was unbelievable. When his foot connected with the ball it was so much higher than an average bicycle kick. Also he caught it full on the laces, such a clean strike. Time stood still for those milliseconds. It was a real honour to be there to see it with my own eyes. As a commentator you crave those big moments and that was the biggest of the season for me. Ronaldo received a standing ovation from the Juve fans and I’m sure that goal was in no small part a determining factor in bringing him to Turin as a new signing a few months later. Vicki Sparks: My best moment was Toni Kroos’ late winner for Germany against Sweden at the World Cup. For a commentator, this match had everything. The drama of Germany heading out at half-time, the growing pressure in the second half, the sense of anticipation (and desperation) as Kroos stepped up to take a free-kick deep in injury time. A clever one-two – a sublime strike – back of the net, and the world champions alive and kicking (for one more game, at least!). My worst moment was Pepe’s dive at the end of Morocco v Portugal. I mean, it’s so bad, it’s almost funny. John Murray: Horror show of the year befell the unfortunate Loris Karius in the Champions League final. Not one but two calamitous errors were later put down to him having suffered concussion in a collision with Sergio Ramos but in the future whenever I am asked to come up with matches players will want to forget, Karius in Kiev will be top of the list. Russia provided so many memories but for sheer tension and drama the moment England won their penalty shootout against Colombia stands out. I am not sure I have ever felt like that before while commentating on a football match. Gareth Southgate and England had got so much right up to that point but how they would ultimately be judged was in the balance right there and then. And one funny from the World Cup: I got talking to a supporter in Nizhny Novgorod who, on arrival there, couldn’t find his accommodation. Turned out he’d booked a room not in Nizhny Novgorod but in plain old Novgorod… which is hundreds of miles away. Happily he was able to make alternative arrangements. The most unusual view of World Cup 2018? Conor McNamara: Climbing to the top of the temporary stand in Ekaterinburg with Dion Dublin at the World Cup was definitely a highlight. In order to comply with Fifa rules, all stadiums used at the World Cup needed to have a minimum capacity of 35,000. The Ekaterinburg Arena fell below that capacity, so the Russians erected enormous temporary stands at either end of the pitch to increase the capacity to the required level. I have never seen anything done on this scale before. The top of the temporary stand was much taller than the original roof of the stadium. Precision Russian engineering ensured it was safe and secure, but I cannot imagine something like this ever being signed off in the West. Myself and Dion Dublin took a walk to the top of this temporary structure and it was the most bizarre and unusual experience of our World Cup trip. Ian Dennis: In October the experience of commentating on England’s first ever match played behind closed doors in Rijeka, Croatia was a particularly surreal one. It was eerie, it was surreal and the night before the match at the stadium all we could hear was a barking dog. We joked if its owner turned up then England would be playing in front of one man and a dog! We were also conscious of being too loud with our commentary. At one stage I mentioned Emile Heskey, who had presented Ben Chilwell with his England shirt, only for Emile to look round. I hadn’t realised he was there just seats away sitting next to Jamie Carragher, who then laughed and asked why we didn’t mention him! Alistair Mann: I certainly conducted one of the funniest interviews I’ve ever done for Match of the Day this year. Cardiff City centre-half Sol Bamba had just netted a 90th-minute winner against Brighton and in the delirious celebrations which followed, he threw his shirt off with uncontrollable glee. I’m not sure how the officials missed it but he was never given a yellow card. In a thoroughly entertaining interview afterwards, Bamba was in great form and admitted his pleasant surprise at not being booked – he even admitted being a little conservative with the truth when referee Martin Atkinson asked him directly whether he’d partially disrobed in the aftermath of the goal. On national TV he cheekily admitted to “telling a porkie” to the experienced official. Sol Bamba admits to telling the referee ‘porkies’!